One month after social TV app Zeebox finally arrived on Android, the second-screen platform has announced a slew of new features designed to better engage audiences. Today’s announcement means that celebrities can use the app to draw fans into their shows, whilst letting viewers set up group chat rooms based around their favourite programmes. We’ve written about Zeebox on a number of occasions before, and we recently interviewed the UK company’s founder Anthony Rose about the rise of social TV. Just to recap, Zeebox turns your mobile device or laptop into an interactive companion that enhances whatever you watch on your main TV screen – it knows what you and your friends are watching, and it lets you all share, chat and tweet about whatever’s on. Constituting Part of Zeebox’s drive to innovate the second-screen experience, the new Shout Out and Group Chat features are designed to create a viral, social space around TV programmes. The Shout Out button enables viewers to react to what they’re seeing on-screen by instantly messaging their emotions to friends and followers via Zeebox, Twitter or Facebook. The button is designed to promote shared live TV viewing among friends, and the company says it will serve as a way for celebrities to drive audience figures upwards. Group Chat, on the other hand, enables anyone in Zeebox to share or tweet a link that instantly launches the Zeebox app and a chat window where buddies can engage around their favourite show. Group chats of thousands of users will be possible, and this feature will be used by broadcasters and their presenters/pundits to create celebrity-driven chat rooms around the most social TV shows. 2012 is gearing up for a big year in the social TV space, with Zeebox announcing a partnership with BSkyB to co-launch a second-screen experience under the Sky+ banner, expected to launch this summer. And Orange rolled out its very own second-screen app in the UK earlier this month, after TVcheck saw significant uptake in France. 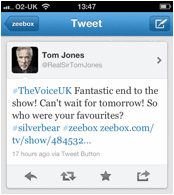 Other features in the new Zeebox release include: Twitter tribes, which let you see tweet streams for different teams during a big match or follow the stars on your favourite show; the ability to ‘book’ programme reminders directly from the programme guide; and, by popular demand we’re told, the TV remote control function now has Auto and Manual modes. The new release is available in the UK iTunes store now, with updates for the Android and Web versions due out later this week.